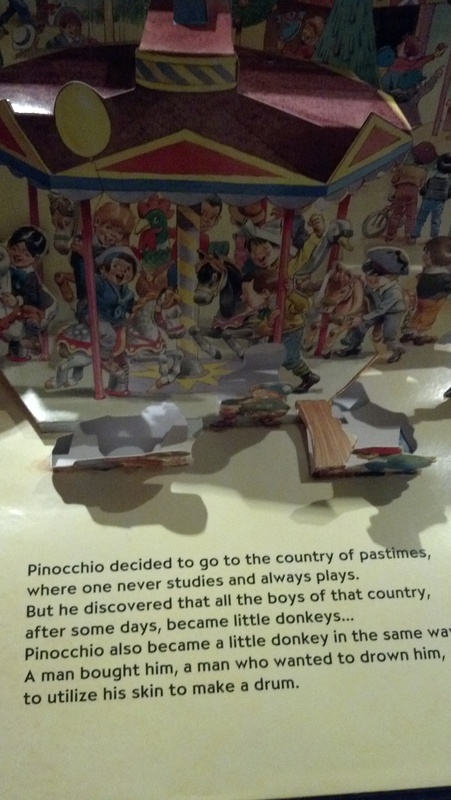 Your parents go to Italy and bring back a pop-up Pinocchio book for your daughter. Aw, that was thoughtful. Thanks Grandma and Grandpa! Upon reading it to your child, you discover some glaring grammatical issues due to poor Italian-to-English translations, but dismiss them because – hey, that’s amore! A man bought [Pinocchio], a man who wanted to drown him, to utilize his skin to make a drum. Well sweetie, you can drown someone by holding their head under water, you can skin someone with a sharp knife, and then you could make a drum out of that skin if you stretch it really tightly over a cylindrical object. No, that is not how I answered those questions, but WTF, Bookmaking People. I didn’t think I’d need to proofread my daughter’s books until the tween years, which is totally why I’ve already read the Twilight series, but I guess I was wrong. Lesson learned. Also, never trust Italians. Fortunately I don’t think it’s Gepetto (not 100% sure because the book is so poorly written). In my mind I can’t help but picture him as the creepy skin-suit-making guy in Silence of the Lambs. Yet another reason why I finally got rid of this book of nightmares. omg. you mean ted devine as jamie gumm (yes, i JUST pulled that out of the memory banks). “oh… waitaminute, was she like a great big fat person…?” oh…. what a MOVIE! “tick tock, clarice…” shivers. Gahhhh so creepy I can’t stand it. Whuh? What is this creepy skinning crap? I don’t remember that from the story of Pinnochio. Good lawd. And good lesson. Must screen baby books. Okeley dokeley. The whole book is a rather shady interpretation. But yes, the murder/torture aspects were new to me as well. Even in the Disneyfied version, the boys turned into donkeys and were sold for the salt mines and circus. In the original book, after Pinocchio (as a donkey) was sold to the circus, he injured his leg and was sold to a man who wants the donkey’s hide to make a drum. He’s thrown into the sea to drown, but then the donkey skin is eaten off by fish, and he returns to being a wooden puppet. Good to know! Your version is much easier to understand than this book. Poor Pinocchio. I guess that nose was the least of his worries. Am crying with laughter at this post because OH.MY.GOD. how could you have possibly known that it would be that graphic and gross!!?? My daughter brought home a library book last year that just the first chapter alone caused me to send an email to the librarians. Here is it the book said…she was in 2nd grade at the time. Chapter 1 is called The Free Stuff Room. My name is A.J. and I hate school. There is only one room in Ella Mentry School that I really like. It’s the lost and found room! The lost and found room is right near the office. It is the coolest room in the history of the world because there is lots of free stuff in there. Me and my friends Michael and Ryan call it “the free stuff room.” You can get just about anything you want, and you don’t even have to pay for it. So if I feel like getting a new baseball cap or a pair of sunglasses, I don’t have to go to a store. I just go to the free stuff room at school. It’s awesome. Needless to say, I let my daughter know that stealing is not an option in our family!